It’s Indigenous, it’s in the Blood! When does the simple appearance of a plant become a sign? When we are willing to stop and listen. Mine was Bloodroot precisely on spring equinox. It was a sign that I had made it through winter. A strangely mild winter and an immune challenging early spring, Sanguinaria reminded me that it was time to support my liver and not be caught off guard by the unpredictable and erratic nature of spring. And it was tax season besides, which is stressful enough. Two years ago at the exact moment of spring equinox I descended into a bad bout of bronchitis that took me down hard and would like to have killed me. It required nothing less than a serious recommitment to living in harmony with the seasons and a re-bolstering of my immune system. Bloodroot would have been a good ally had I been attuned. This year I would be. Resurrected like Persephone on her return to the light, I arrived healthy at the turning of the season – a testimony that my efforts were paying off. Spring equinox dawned bright, beautiful and warm. My son had returned from his most recent journey and was camped outside our house in his motorhome. We couldn’t think of a better way to celebrate the vernal equinox than by hiking the Blue Ridge through the Pisgah National Forest with the GreenMan (my husband) and Dawn, a friend, fellow muse and interpretive sign dancer. The four of us struck out accompanied by Dawn’s four-legged companion, made two stream crossings, and climbed the nearest ridge where views of the mountains were still visible through trees not yet leafed out. 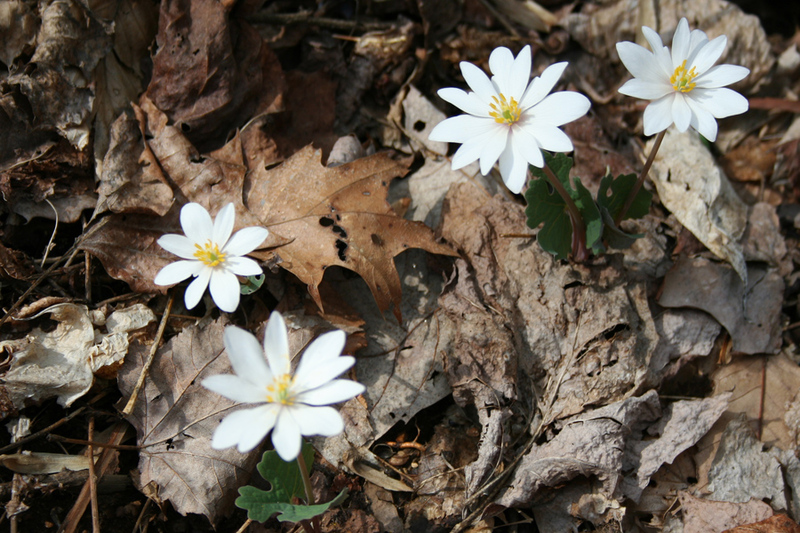 The abundant presence of Bloodroot, delicate in her ephemeral bloom, was a joyous heralding of spring. The festival celebrating vernal equinox called Ostara, as the story goes, is characterized by the rejoining of the Mother Goddess and her lover-consort-son who had spent the winter months in death. It felt significant to be rejoined with my Gemini astrologer son at the turning of the wheel, and with his urging we all walked barefoot a good distance down the trail, so as to connect with the earth and recharge our DNA. Bloodroot is one of the earliest blooming spring wildflowers and is native to eastern North America and Canada, hence its species name of canadensis. 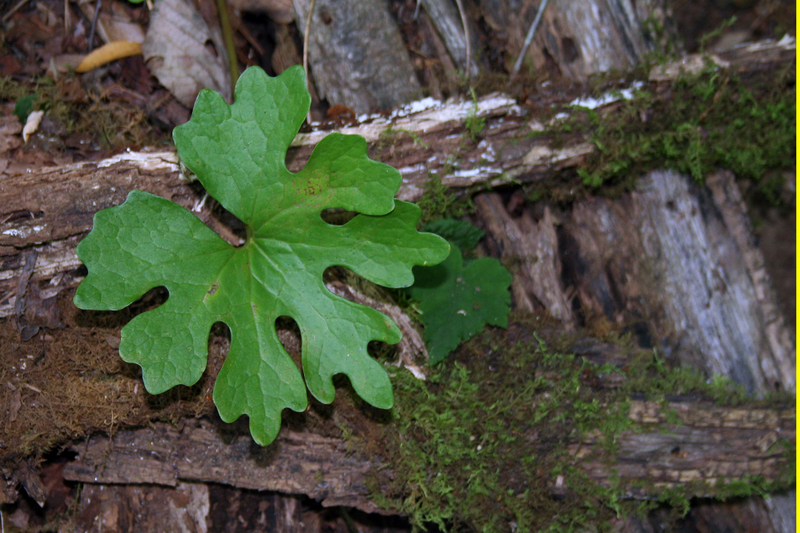 It likes to grow on wooded slopes above a stream, which is exactly where we found it. Deer will eat it in early spring, and anything that deer like to eat usually gets my attention. The flower blooms briefly and as it fades the irregularly lobed leaf unfurls and resembles a jigsaw puzzle piece. It is one of the most well known indigenous medicinal plants in the Appalachians where it has a long history of use as a respiratory aid. The flower is a real beauty and quite captivating in its white contrast against the brown, dead, and decaying leaves of an earlier season. Its flower essence is used to transform inherited physical, emotional, mental and spiritual genetic patterns into the light of new potential. Watching my son stepping barefoot into the creek surrounded by these lovely little flowers I held a prayer for the embodiment of our full potential in this lifetime. It’s Earth-Spirit Medicine helps to heal our family lineage and the ancient wounds that still live in our DNA. How perfect that we were walking barefoot through the Bloodroot! 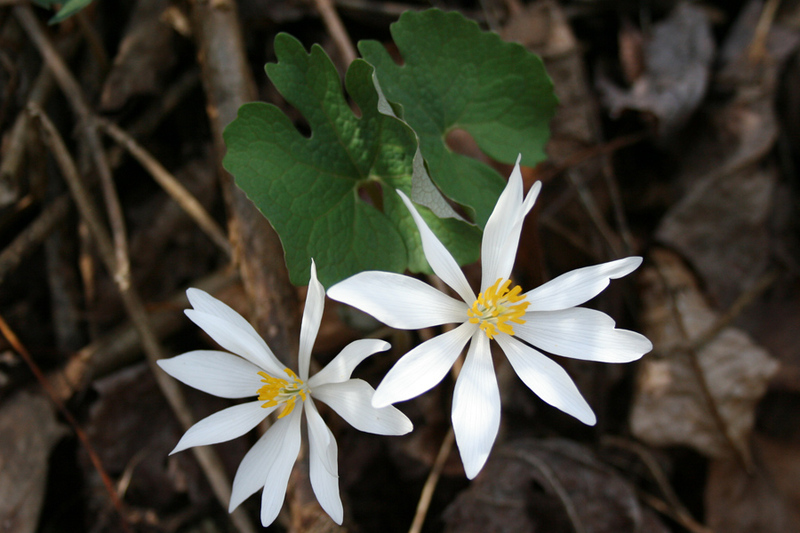 Bloodroot finds its main use in the treatment of bronchitis and is effective against chronic congestive conditions of the lungs. A low dosage tincture in combination with other expectorant and demulcent herbs such as mullein, and plantain, helps to relieve bronchitis, coughs, lung congestion and inflammation. It relaxes the bronchial muscles and helps ease difficult breathing. At the same time it acts as a stimulating expectorant to clear lung congestion, and reduces inflammation in the throat and chest and relieves spasmodic coughs. Sanguinaria’s main herbal actions are expectorant, and antispasmodic. According to David Hoffman it is one of the best respiratory amphoterics. Amphoterics are normalizers that change and adapt their action depending on the condition. It is also used topically as a salve to treat sores and ulcers. Fresh root poultice is used with caution to treat fungal growths and ringworm. 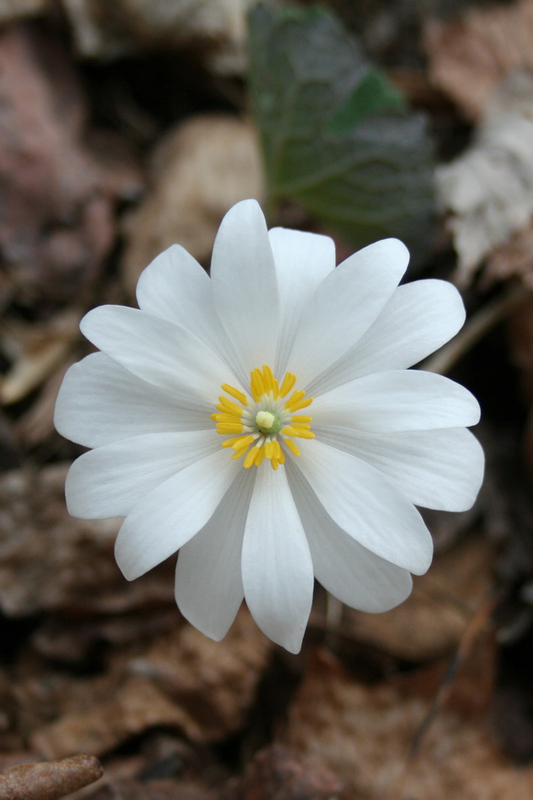 Bloodroot’s alkaloid sanguinarine has been used in dental hygiene products to reduce plaque and gum inflammation. Spring is the perfect time to harvest the root when the plant is in full bloom, being mindful not to exhaust the plant population and taking care to wear gloves. When the blood-red root is cut, bright orange juice is secreted, hence its name. This juice is caustic and may cause skin irritation. Here in the Appalachians bloodroot is a popular natural red dye used by Native American artists particularly among the southeastern rivercane basket weavers. May the ally of bloodroot find its way to you in your time of need and her flowering essence remind you of the new beginnings in all areas of your life. As one season, one great cycle ends at this turning of the ages, another begins and we are made new. Not unlike Persephone we will return to the light of knowing that we have everything we need in every given moment and are being divinely guided. We are all indigenous to this our Mother the Earth. It’s in our roots. And it’s the blood! Bloodroot, and the flowering of a new potential. Preparation: Tincture made from the fresh root is preferred with the dried root being more suitable for making infused oils and salves. Salves will cause some degree of inflammation and may be an effective external treatment for cancerous growths. • Fresh root tincture – 1:10 in 50%. Dosage: 10 drops of tincture diluted in water three to four times a day. May also be used as a mouthwash to treat gum inflammation. • Dried root tincture – 1:5 in 60%. Dosage: 10 – 15 drops diluted in water three times a day. • Decoction: 1 teaspoon of rhizome in 1 cup of cold water, bring to a boil and infuse for 10 minutes. Drink 3 x a day.